Ever feel a little envious of people with perfect teeth? In most cases, they were not born with flawless smiles. White, straight, gorgeous teeth are often the result of careful cosmetic dentistry. In many cases, those smiles are made with Cerinate Lumineers, the gentle alternative to porcelain veneers and braces. Under the skilled hands of Dr. Ken Cirka, Dr. Jessica Meier, Dr. Mimi Jeon and Dr. Stephanie Smith you can choose a Lumineers smile makeover to transform your teeth into a flawless smile. Lumineers are shields of super-thin Cerinate porcelain. Though they are as thin as contact lenses, Lumineers are incredibly durable and stand up to the normal stressors that teeth must endure, like heat, cold, and pressure. The Lumineers cosmetic dentistry treatment is attractive to many patients because the application of the Lumineers is less-invasive than that of porcelain veneers – and the results are nearly identical. Lumineers are not one size fits all, however. The porcelain shields are customized for your smile in width, length, color, and translucency so that they look natural and complement your appearance. It usually takes two visits to your Philadelphia dentist to complete the Lumineers procedure. Impressions are taken, the dental lab creates your unique Lumineers, and the approved final veneers are bonded permanently to the front of your teeth to complete your smile makeover. For more answers to common Lumineers questions see our Lumineers FAQ. If you have good oral health and no sign of gum disease or decay, you may be a good candidate for Lumineers. Your Philadelphia cosmetic dentist will conduct an exam and review your smile goals to determine whether this treatment is right for you. Any patient who is eligible for a smile makeover with porcelain veneers or Lumineers must compare the two procedures. They offer the same flawless results, but Lumineers differ from veneers in multiple ways. 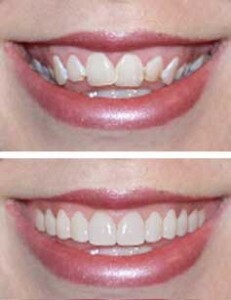 Composition of the veneer: Porcelain veneers are thin, but Lumineers are digitally designed to be even thinner. Both are stain resistant and can last for decades with the proper care. Non-invasive preparation: The Lumineers application is non-invasive and the ultra-thin nature of the Lumineers usually requires very little of the tooth enamel to be sanded down, if any. Veneers require the shaving away of a significant amount of tooth enamel. Painless: Since Lumineers have minimal prep, anesthesia is usually not necessary to minimize sensitivity or discomfort. Veneers require an anesthetic. Quick application: Once your Lumineers have been digitally designed just for you, they are tested on your teeth to confirm the proper size, color, and shape and then permanently bonded in place. Reversible procedure: Because the tooth structure is preserved under the Lumineers, the procedure is usually reversible should you ever choose to do so. Long-lasting: Lumineers are guaranteed for five years against chipping, separating from the tooth, and breakage. Clinically, Lumineers have been proven to last up to 25 years with no shade discoloration. They can be placed over old crowns or used to help rejuvenate bridgework to create a more uniform-looking smile. Both Lumineers and veneers have their advantages and disadvantages depending on the current state of your teeth and smile makeover goals. Ultimately, whichever procedure you choose, it will create a natural-looking smile that makes you look better, healthier, and even younger. Dr. Cirka was one of the first dentists in Philadelphia to provide Lumineers to his patients, and he has placed more porcelain veneers than any dentist in the Philadelphia area. There are various ways to straighten your teeth, and Lumineers is not the only option. Traditional porcelain veneers may be better for your smile makeover, or you may be an excellent candidate for Invisalign. Schedule a consultation with Dr. Cirka, Dr. Meier, Dr. Jeon and Dr. Smith to learn about your unique smile makeover options.